The academic journal “Journal of the Academy of Labour, Social Relations and Tourism” invites researchers, academics, experts in economics, law and social sciences including social work to submit their contributions that fit the journal scope and thematic coverage. All submitted manuscripts have undergone rigorous peer review. A manuscript can be submitted in Ukrainian, Russian or English. A manuscript in proficient academic English can be published free of charge. Other manuscripts are published on the fee-based conditions. 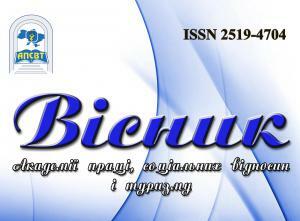 Any further information regarding journal scope and requirements to manuscripts is available on the journal web-page http://www.socosvita.kiev.ua/publishing/bulletin (currently in Ukrainian) and can be sent on request (visnyk@socosvita.kiev.ua).